These are some rather amazing electric metal driveway entrance gates – quite a good design – that is, if you have enough bodyguards and property guards to keep the burglars away. Metal security gates are great for security so why not show off a bit – if you have no taste that is. Metal gates - for Bill Gates? Not sure what the neighbors might think – but perhaps they also have them – keeping up with the Joneses and all that. 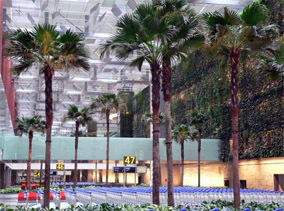 These would be electric metal gates, operated by remote control, this is standard in Asia, and US but less so in UK. If in Asia, if in the fairly big middle class and above bracket, you might have a large house, and since everyone has to drive everywhere, due to the heat, distances and lack of pavements or sidewalks, remote control electric gates are very useful – and safer as you don’t have to get out of the car, and be vulnerable to attack, kidnapping or mugging. 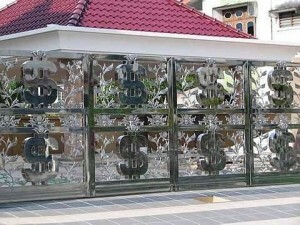 1 Response to "Metal gates, metal driveway gates, metal security gates, electric gates, very bling, seen in Asia"